In a survivalist scenario, one of the most important things you need besides food and warmth is water. Having a clean source of water is essential to life, not just for you and your family, but for your animals as well. .While a nice, crystal clear stream or lake sounds like an ideal source of water, it may be your worst choice as a water source, especially if its near any type of chemical processing plant or even near a farm. This is where having water barrels filled with, clean or purified rain water can save lives. - Rain is quite often a more pure source of water than a river, stream, lake or even a spring. These can often be polluted by bacteria from animals, offal or even human activity such as straight-pipes or farming. - Plastic buckets with lids that seal, larger containers with screw on tops and even outdoor type trash cans and 55 gallon drums can be used as a point for water collection. 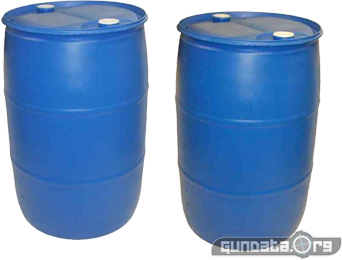 - While water barrels and rain barrels can be purchased at most big box home improvement stores, recycling containers used for foods such as lard is an inexpensive way to build up a supply of storage containers. Make sure the container has only been used for human food storage (FDA approved). Containers used for the storage of chemicals should be avoided at all costs. - Water should be stored in a cool, dark place to discourage the growth of bacteria or fungi. Stagnant water, even water that's improperly stored can go "bad" because of this. - While having home or commercial grade water filters is extremely helpful, not only may more steps need to be taken to make sure the water is safe for human consumption, but the availability of filters may be challenging. To strain off larger pieces of debris and dirt, filter the water though cloth. This is also a good idea if you have a standard filtration system handy to keep large debris from clogging your filters quickly. - Having a water testing kit available can save lives. You can determine if the water is drinkable, can be treated or needs to be discarded due to chemical or bacterial infestation. - Water treatment kits are essential as well. This could be something as simple as having iodine on hand, although if you or someone in your family is allergic to iodine or shellfish (an indicator of iodine allergy), you may need to rely on other water treatment options such as chlorine. However, being able to boil the water after filtering is the best way to ensure it is clean and pure. - Keep in mind stored water may often taste "flat" or even take on some of the "flavor" of the container it's been stored in. One way to make stored water taste better is to areate it by pouring it between containers or using a bit of salt or water flavoring such as lemonade mix to make it more palatable. Having a source of water, even if it isn't perfectly clean is essential. With water treatments and filters, the "clean" factor can be addressed which means you can have water when you need it. The dangers you may face in a survival situation isn't just in the things you can see, they're in the things you can't see as well.